Red Rock, Deer, and beautiful meadows are the draw here. 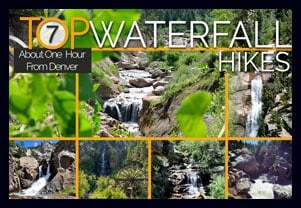 This hike is on the south-west side of Denver in Littleton, Colorado, and very accessible from 470. When there is good snowfall, it would be perfect for snowshoeing and cross-country skiing. This Denver trail has been one of our favorite sunset hikes because of the way the setting sun lights up the red rock. Click Here for the Full Trail Profile. It might sound kind of strange to say, “We’re headed over to the arsenal for a hike”, but the Rocky Mountain Arsenal has been turned into what has been called an “island of habitat” in the middle of the city. There are lakes, Bison, waterfowl, deer, burrowing owls, all just about 7 miles east of the center of Denver. The Rocky Mountain Arsenal features several hikes, and we profile a beautiful one at the trail page for the Lakes Loop Hike. Finally, be sure to check their seasonal hours at their website. When you enter Roxborough State Park, it is a bit like entering a different world. There is a real sense of being down and inside of it because the towering red rock creates such a unique space. 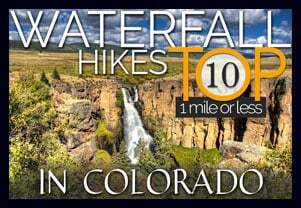 This is one of the best winter hikes near Denver because you are often shielded from the wind, and the trails of the valley floor are fairly level. If there has been a lot of snow, we would suggest you call the park office to be sure that the road is clear. We have a couple trail profiles in the links below, but the park offers several other options as well. 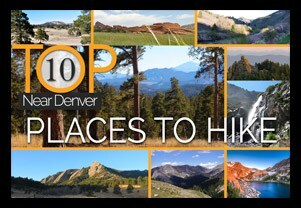 If you have any hikes that you would add to the list of Best Easy Hikes Near Denver, then post a comment. If we haven’t profiled them yet, we will. Wes, thanks. This continues to be one of our favorites. Went on the South Valley trail a couple of weeks ago. Love it, now we are going to try one of the other ones you suggested. We have a 7yo and a 3yo this is a perfect reference to our out door fun. I did the Roxborough State Park Fountain Valley trail this afternoon and it is quite impressive. Lots of great photo opportunities with some amazing rock formation landscapes. It’s a fairly simple hick with only small elevation changes. Definitely recommended if you’re in the area.